On April 12th of this year, Christann Shyvin Gainey, L.P.N., was caring for a patient named H.R. McMaster, Sr. who was recovering from a stroke in a Pennsylvania facility. During her shift and unwitnessed, Mr. McMaster fell and nurse Gainey was seen on surveillance video failing to perform neuro checks thereafter as required by the facility’s policy. Mr. McMaster was found dead sitting in the lobby of the facility. He suffered blunt trauma to the head from an unwitnessed fall and developed a subdural. Nurse Gainey has now been criminally charged for the involuntary manslaughter of Mr. McMaster and faces possible other charges as well. I wish to point out that the late Mr. McMaster was the father of President Trump’s former National Security Advisor, H.R. McMaster, Jr.
What bothers me about this case is that, if the claims are true, then this is malpractice. She had a duty to perform a neuro check and breached that duty by not doing it. Had she performed the neuro check, it is possible that Mr. McMaster’s declining neuro status would have been recognized and he might have had treatment and survived. This is negligence; not a criminal matter. I have been involved in several of these types of cases and I don’t know of any nurse who was charged criminally. 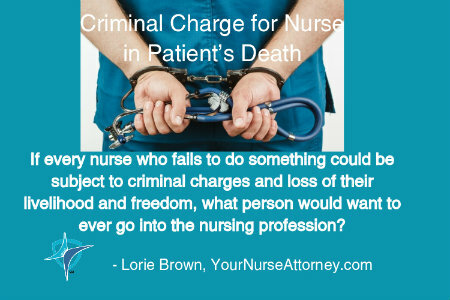 If every nurse who fails to do something could be subject to criminal charges and loss of their livelihood and freedom, what person would want to ever go into the nursing profession? Every day, nurses have the duty to do the most difficult things in taking care of their patients. Yet, if their freedom should be on the line by being subjected to criminal charges, that is another story. We don’t know if she had 50 patients to care for or what was happening that night. According to the news accounts, Ms. Gainey tried to cover up the neuro checks and reportedly falsified her paperwork by documenting the neuro checks and one 20 minutes after Mr. McMaster passed away. The video showed otherwise. Admittedly, this is just one side of the story and it belongs to the prosecutor. We will not full story until when and if everything is released. If it is proven that Nurse Gainey falsified the medical record, and apparently there is video to document this, that would show a fatal flaw. I hope this does not set a precedent to criminally charge nurses for what should be classified as negligence. I hope Ms. Gainey is acquitted. It is sad to think that there may be a different handling of a case if a patient is connected to someone who worked at the White House. This does not set a precedent – nurses have been criminally charged before. TAANA wrote a position paper on it with AALNC. It is a shame that nurses seem to be under attack by patients, administration, law enforcement, bullying, sexual abuse, mandatory overtime, and now criminal charges. There is much talk about a shortage of nurses coming, with these on-going types of abuse prevalent in nurse’s working condition and stagnant wages, it is likely that the shortage will become more severe. Thank you for posting. When I saw it on TV I knew you would be interested. Apparently, this is not the only case that has been prosecuted this way. in Darby, PA another nursing home was raided by the police and District Attorney for allegations of neglect and abuse. This was St. Francis. Records were confiscated. A patient was admitted there and the report said they developed pressure injuries down to the bone within a week. When the person was admitted to St. they had no pressure injuries. I believe this facility is on probation. I know from personal experience that patients have been transferred out of there to other facilities. Lori, another sad story about a patient who has suffered an injury and died while in the care of people who are charged to call for them. You are right we don’t know all the facts. I hope the nurse had malpractice insurance as she has some serious charges. My question is: Can LPNs get their own malpractice insurance? I know RN can, but can LPNs as they have to work under the supervision of an RN. I have a friend whose mother is in the facility where this situation took place. She has been in there for a least 10 years. From what I understand, it is a very well run facility. Yes LPNs can get malpractice insurance but there is no type of insurance that I know of that will cover a nurse for a criminal matter. Thanks for your comment and thanks for letting me know about this matter. You can check the nursing home reports through your department of health to determine if they are in compliance with the laws.